Motherhood, career; both, one, neither. The choice and decision is yours. In today’s Telegraph there is an article on Vivienne Durham, Head of the independent school, Francis Holland Regent’s Park. The headline, “Girls must choose career or motherhood, says top head” to me seems not to tie in with what she has been quoted as saying in the body of the article. Below are the quotes from the article. I’ve left out anything which isn’t in quotes as that’s the writer’s interpretation of what she said. 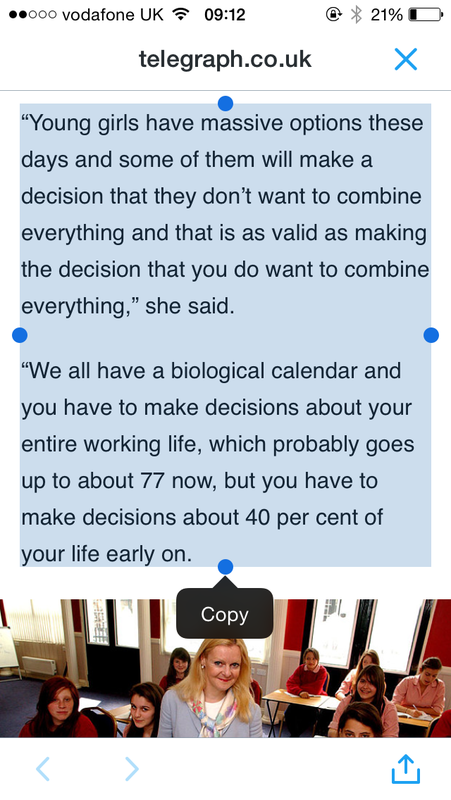 So, reading the above, I don’t get the impression she said girls can have a career or motherhood but not both. I think she’s saying tell girls about the glass ceiling. She’s saying girls should be free to make a choice of their choosing once they know all the facts. 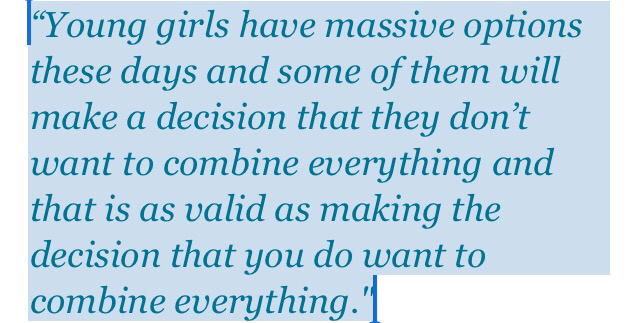 She’s saying girls shouldn’t be judged harshly for the choice they eventually make. I don’t find anything wrong in this, do you? I think women ARE judged for the choices they make. If they have children and work, they are judged. If they have children and don’t work, they are judged. If they don’t have children and work, they are judged. Surely, in the 21st century a woman should be able to make any of the above choices without being judged. And THAT is my interpretation of what she said. 2 Responses to Motherhood, career; both, one, neither. The choice and decision is yours. Thanks for this, Naureen. I know Vivienne quite well and did find this interesting. When I was President of the Girls’ Schools Association in 2009 I promoted similar messages – not that it ISN’T possible to have both a career and a family, but that it can be tough. I didn’t want the girls we were responsible for educating to believe all the battles were fought and won and it was now easy. If we gave them that impression, and they did hit a wall at some point, they would feel they had failed. I talked about the importance of having support networks, including, where appropriate, from your partners. If you make a joint decision with a partner to have a family, it should be a joint responsibility, in my view. Having said that, I know a number of working mums are single parents, so they have to look elsewhere for that support, but they definitely need it. Often they can manage OK until children are ill and then things can fall apart. I must also just say that a (larger than we realise) proportion of women find that they can’t have children (or have a life partner who can’t) so the idea that we all have this choice is also, sadly, misleading. I find it ironic that the focus of SRE in schools is often abut avoiding unwanted pregnancy, giving girls the impression that as soon as they’re “ready”, it will happen. Of course it isn’t quite like that. And if women do leave it late, assuming that they can easily conceive later in life, that can also cause issues. Thanks for sharing this. It’s something I think we need to keep thinking about and talking about – ESPECIALLY when we disagree! Thank you so much Jill for you comment. I agree with every word you’ve said. I think in a way my daughter is under more pressure than my mother or grandmother were. What we need to do is to work out how to support these girls and women of today as they navigate their way through life.